It’s time for another round of Foodbuzz 24, 24,24, whereby 24 bloggers post about 24 different meal experiences in 24 hours. 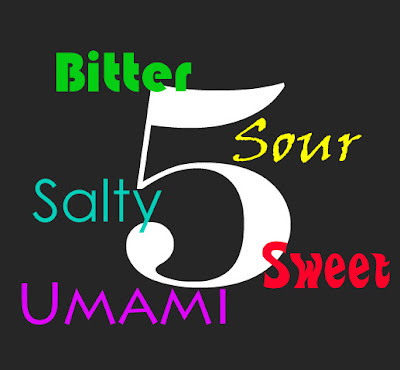 This month I proposed to make a five course meal, with each course highlighting one of the five tastes, which are bitter, salty, sour, umami and sweet. The folks at Foodbuzz thought that was a good idea so here we are! Let’s get right into it. The first taste that I wanted to highlight was bitter. 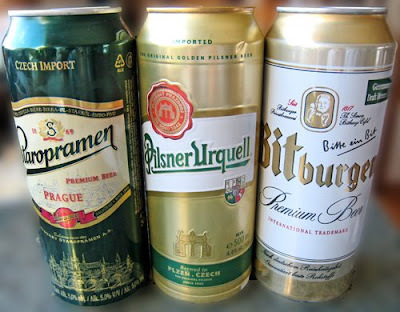 The bitter taste can also be described as sharp and can be detected in chocolate, coffee, olives, beer, bitters and some leafy greens. Since it’s my dinner to host I’m allowed to say that liquid courses count! That means it’s time for beer. To whet our appetite for more good things to come, we sampled some European imports. Beer always makes me hungry for snack food so it’s a good thing the salty course was up next. Salty tastes are produced predominantly by the presence of sodium ions. My favourite example of the salty flavour is bacon and I seriously debated for a while about just serving a few different slices of homemade bacon on a plate. Who wouldn’t love that? My somewhat rational side eventually vetoed that idea but only because I decided to enhance bacon with other delicious things like potatoes and cheese. Roasted Potatoes with Bacon, Cheese and Parsley from Gourmet complimented the beer perfectly and it began to become clear why it’s essential to combine all five tastes for ultimate enjoyment. After all of that saltiness we needed a palate cleanser. Sour taste buds to the rescue! Sour is the taste that detects acidity. The most common food group containing sour tastes is fruit like lemons and limes but wine can also have it. 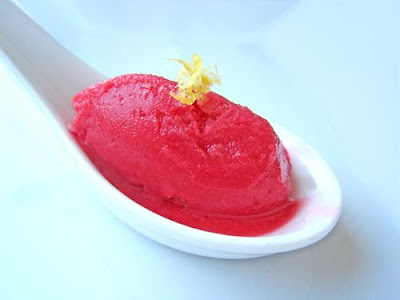 One bite of this mouth puckering Lemon Raspberry Sorbet is all you need to know exactly what sour tastes like. It’s definitely not dessert and you wouldn’t want a whole bowl of it but it was a great way to prep the mouth for umami. U-ma-what??? Just keep reading. Umami is the 5th taste, although it is only as recent as 2002 that it has been included in culinary textbooks and literature as such. The concept, however, is not new. Escoffier identified sauces made with veal stock as having a flavor distinct from the four primary tastes although it took another hundred years before this fifth taste was finally accepted as valid. The word umami is Japanese and can mean yummy or delicious and has been described in English as meatiness, relish or savouriness. The umami taste is produced by compounds such as glutamate and is commonly found in fermented and aged foods, among others. Some examples of food containing glutamate are beef, lamb, mushrooms, parmesan and Roquefort cheese as well as soy sauce and fish sauce. I decided to take a cue from Escoffier and made Roasted Veal Chops with Morels to give my main course that umami taste. Finally, we end our meal with the sweet taste, one that is generally regarded as a pleasurable sensation. Sweetness is found in sugar rich foods and naturally in things like fruit, honey and maple syrup. 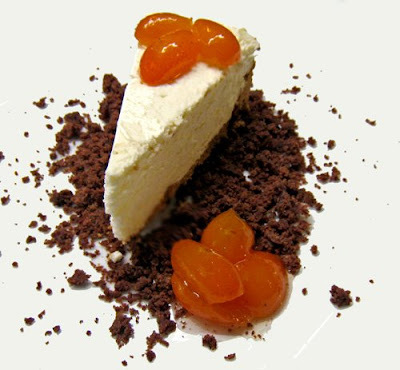 I chose to go the less than natural, (but still very sweet) route with White Chocolate Cheesecake with Chocolate Crumbs and Candied Kumquats. Even the sour foods have been made sweet in this dessert, as kumquats are transformed into candied bites of sweetness with the aid of a simple syrup. I usually find white chocolate almost too cloyingly sweet to bear but combined with the tanginess of cream cheese it was actually quite enjoyable. Which reminds me, although each of the primary tastes can be delicious on their own, they’re at their best when combined with one another for a more complete and well rounded flavour. And although I enjoyed my five courses of tastes, I like how they play off of each other best as opposed to being sampled separately. Be sure to check out the other 24, 24, 24 meals, there are sure to be some interesting ones that no doubt make full use of all five primary tastes. And if you’re looking for umami, look no further than the following recipe for Roasted Veal Chops with Morels. Pour boiling water over morels in a small bowl and soak until morels are softened, about 30 minutes. Transfer morels with a slotted spoon to a medium-mesh sieve set over a bowl. Press on morels with back of spoon to remove excess liquid (be careful not to squeeze out all the moisture), then add to soaking liquid and reserve. Rinse morels to remove any grit. Reserve morels and liquid separately, allowing liquid to settle. 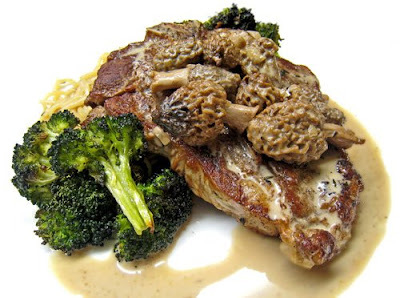 While morels soak, let veal chops stand at room temperature 30 minutes. Pat chops dry and season with 1/2 teaspoon each of salt and pepper (total). Heat an ovenproof 12-inch heavy skillet (not nonstick) over medium-high heat until hot. Add oil and heat until smoking, then add veal chops and sear underside well, 2 to 3 minutes. Turn chops over and sear 1 minute. Add butter, garlic, and thyme to skillet and baste veal with melting butter. Transfer skillet to oven and cook, basting every few minutes, until an instant-read thermometer inserted horizontally into center of chop registers 130 to 135°F for medium-rare, 10 to 15 minutes. Transfer chops to a plate to rest. Discard garlic and thyme, keeping juices and fat in skillet, and return to burner over medium-high heat. (Handle will be very hot.) Add morels and sauté 1 minute. Add shallot and sauté 1 minute. Remove from heat briefly and add Cognac, then return to heat and deglaze, stirring and scraping up brown bits, until most of liquid has evaporated. Slowly pour in reserved soaking liquid, being careful to leave last tablespoon (containing sediment) in bowl. Add meat juices from plate and boil until liquid has reduced to about 1/3 cup. Stir in crème fraîche, swirling to incorporate, and boil until morels are lightly coated and liquid is slightly thickened. Stir in chives and tarragon and season with salt and pepper. Serve chops smothered with morels. Posted by Brilynn at 12:10 p.m. Interesting concept! That sorbet really glows, it looks wonderful! Great idea! And everything looks delicious! I would like a sample of each, please! What a terrific idea this is, Brilynn. That's such a great idea! I love the idea of multi-course meals as a tasting adventure. This is a great idea! Congrats on being excepted. It looks wonderful. Ah Brilynn . . . when can I come for dinner . . . each one of these is super! 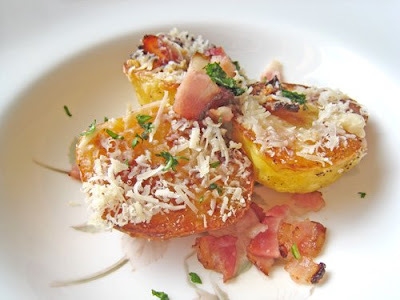 I think I might be able to do the beer, bacon & potato course without a trip to the store. Great idea... Everything sounds delicious. Yup- the five taste synchronization sounds really really delicious - brings out the foodie in you I guess. You had me stumped about the Umami - but was able to relate to it immediately. You've provided the impetus for my next bash! Starting with the beer - naturally. Sounds like a great meal! The morels look fantastic, and the white chocolate cheesecake looks amazing. Wow, sounds like an awesome meal, where do I sign up!